Another popular and faster way to check if String is empty or not is by checking it's length, e.g. if String.length() = 0 then String is empty, but this is also not null safe. Third common way of checking emptiness of String in Java is comparing it with empty String literal e.g. "".equals(str),this method is not as fast as previous two but it is null safe, you don't need to check for null, in case of null it will return false. So, in my opinion, this is the right way to check if String is empty or not. If you definition of empty String also includes null then you can also use Apache Commons Lang's StringUtils class. It has methods like isEmpty() which return true for both null and empty String literal. Again this is also null safe and will not throw NullPointerException. Here are couple of examples of testing for String emptiness without worrying about null inputs. These are not the fastest way of checking emptiness but avoids additional null checks. There will be no null pointers in this case. Both of these way confirms that String is not null and empty. You an see that check against null String is opposite to how equals method behave. So use this method with caution. Since they return true even for null input, they cannot be trusted for tests like not null and empty. By the way, if you have to create empty String, always use String literal "", it's more memory efficient. 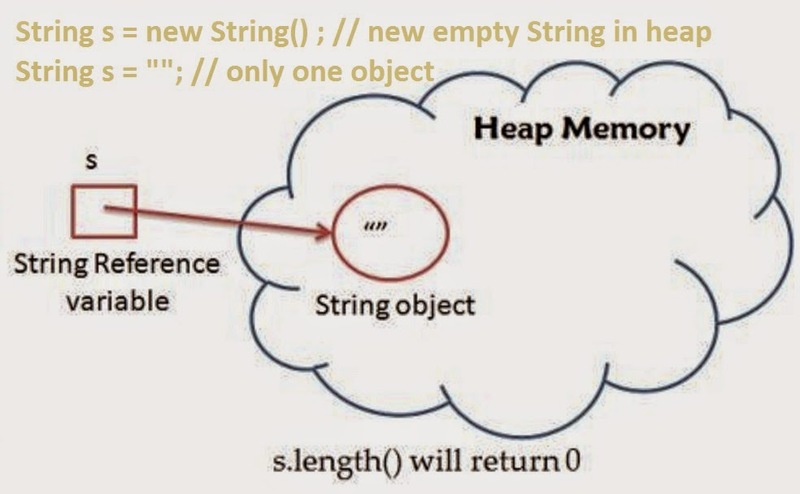 Since String object is Immutable and can safely share between threads, there is no need to create multiple separate String object, as String s = new String() will do, as shown in following diagram. There are many ways to check if String is empty in Java, but what is the right way of doing it? right in the sense of robustness, performance and readability. If robustness is your priority then using equals() method or Apache commons StringUtils is the right way to do this check. If you don't want to use third party library and happy of doing null check by yourself, then checking String's length is the fastest way and using isEmpty() method from String is most readable way. By the way, don't confuse between empty and null String, if your application treat them same, then you can consider them same otherwise they are different, as null may not be classified as empty. Here are three examples of checking String is empty or not by using JDK library itself. * this but, but what is the right way? If you are sure that the String you are checking is not null then use length() method, it's the fastest way. If you give paramount importance to readability without compromising performance then String.isEmpty() is the right way to check String emptiness. That's all about how to check if a String is empty in Java or not. As I said, if your preference is towards safety from NullPointerException then null safe methods are best way to check emptiness e.g. calling equals on empty String literal or using StringUtils.isEmpty() method from Apache Commons Lang. If you are already doing null check and absolutely sure that the String you are checking is not null, use String.isEmtpy() method or simply length() method to check if length of String is Zero. In Android we have TextUtils.isEmpty(String); which emulates the Apache StringUtils and it's usually a safe way to avoid NPEs. First method is worst in term of Android Memory management. "if(str != null && !str.isEmpty())"